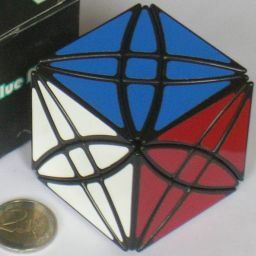 The Master Skewb is a cube-shaped puzzle where the eight corners can turn. The eight cutting planes going through the puzzle are less deep than the cuts for the Skewb, but not as shallow as the Dino Cube, so these cuts are non-regular hexagons. The puzzle has 8 corner pieces, 12 edge pieces, 6 face centre pieces, and 24 other face pieces. A move involves twisting part of the cube around a corner axis by 120 degrees, and that part consists of 4 corner pieces, 3 edge pieces, 3 face centres, and 9 other face pieces. In the solved position each face is a single colour. 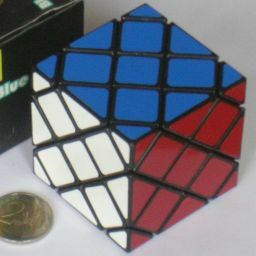 The Rex Cube is puzzle similar to the Master Skewb, except that the cuts are curved so that they meet at the corners of the cube. It therefore does not have the corner pieces that the Master Skewb has. In all other respects the puzzles are the same, so the Rex Cube also has 12 edge pieces, 6 face centre pieces, and 24 other face pieces. Disregarding the colouring, the Rex Cube is equivalent to the Face-turning Octahedron. This gives a total of 4!·36·6!·12!3 / 215 = 42,250,536,084,530,912,624,640,000,000 positions. This gives a total of 11!·6!·12!2 / 214 = 402,478,052,931,440,640,000,000 positions. I will use the standard 6 letters U, D, R, L, F, and B to denote the Up, Down, Right, Left, Front, and Back faces respectively. Any corner of the cube can be identified by the three faces that it is a part of, so can be denoted using the three letters of those faces. For example, URF is the corner where the upper face, the front face, and the right face meet, so is the top front right corner of the cube. I will also use a corner's three letter combination to denote the move that is a clockwise turn around that corner. An anti-clockwise move is denoted by the three letter combination followed by an apostrophe, for example URF'. Use any Dino Cube solution to solve the edges relative to one another. It is fairly easy, as long as you manage to completely ignore all the other pieces of the puzzle. Find the location where that corner belongs - it is the location around which the three edge pieces have the same three colours as the chosen corner piece. If the corner is not already at the right location, then hold the puzzle with the corner at UFR, the location it belongs at UBL, and do UBR UFL' UBR' UFL. Hold the puzzle so that the chosen corner (which now has the same colours as the surrounding edges) is at the UBL location. Look at the corner piece at the URF location, and find out where it belongs by again looking at the edge colours. It will belong at UFR, DFL, or DBR. If it belongs at UFR: Do nothing. If it belongs at DFL: Do the sequence UFR DFR' UFR' DFR' UFR DFR' UFR' DFR'. If it belongs at DBR: Do the sequence UFR DFR UFR' DFR UFR DFR UFR' DFR. Apply steps c-g to this corner. The corners should now be in the correct positions relative to the edges. Note that they will be mixed up in the next few phases, and be solved again at the end. 1. To cycle the centres of three adjacent faces around a corner, hold the puzzle such that the three faces are U, R and F. Then do UBR UFL' UBR' UFL for an anti-clockwise or UFL' UBR UFL UBR' for a clockwise cycle. 2. To cycle the centres of three other faces, hold the puzzle such that the three faces are U, R and L. Then do UBR UFL UBR' UFL' to cycle them R to L, L to U, U to R.
In this phase the off-centre face pieces are moved so that the diagonally opposite pieces in every face match in colour. Find two off-centre face pieces in the same orbit and of the same colour that are not yet paired up, and so lie in different faces. Remember that the pieces of an orbit lie on the diagonals of the faces that together form a tetrahedron. 1. Hold the puzzle so that one of the pieces is in the U face, at the UFR corner. 2. If the other piece is in the bottom face, then do DFR UFL' DFR' UFL. 3. Hold the puzzle so that one of the pieces is in the U face, at the UFR or the UBL corner, while the other piece is in the front face, at the FUR or the FDL corner. a. U piece at UFR, F piece at FUR: Do nothing. b. U piece at UBL, F piece at FUR: Do UBR UFL' UBR' UFL. c. U piece at UFR, F piece at FDL: Do DFR UBR' DFR' UBR. d. U piece at UBL, F piece at FDL: Do UFL DFR' UFL' DFR. Hold the puzzle so that the two pieces are at the UFR corner in the U and F faces. Bring the two pieces together with the move sequence UFR' DFR' DBL DFR UFL DBL UFL' DBL UFR. Repeat steps a-d until all the off-centre face pieces are paired up on a diagonal of a face. Examine the pairs of off-centre pieces that lie in one orbit. If four pairs of them are already solved, (so at most two pairs are incorrect) then skip ahead to step f.
Find three pairs of incorrect off-centre pieces that you want to swap around. Hold the puzzle so that at least two of the pairs meet at the URF corner and lie in the U and F faces. All these sequences move the U face pair to the F face. To cycle the three pairs in the opposite direction, apply the sequence twice, or do its inverse. Repeat steps a-d until at least 4 of the pairs of an orbit are solved. 1. Hold the puzzle so that one pair is in the U face and adjacent to the URF corner, and the other pair lies in the F or the D face. 2. If the other pair lies in the D face, then do DFR UFL DFR' UFL' so that the pair to be swapped lie in the U and F faces. 3. Do the move sequence URF UFL' UBR ULB UBR DBL' UBR' DBL ULB' UFL UBR' URF' to swap the U and F pairs. Repeat steps a-f for the other orbit, so that all the face centres have been solved..
Find three face centres that you want to swap around. Hold the puzzle so that two of the face centres lie in the U and F faces, and that the U centre piece belongs in the F face. Repeat steps a-c until all the face centres are solved. If you end up with two face centres swapped, then you have made a mistake in phase 2 - the edges are in the mirror image arrangement compared to the actual solution. Find any corner piece that is in an incorrect location, and also find the location where that corner pieces belongs. Hold the puzzle so the corner is at URF, and the location it belongs at UBL. Do UBR UFL' UBR' UFL three times. This should correctly position one tetrad (the UFR, UBL, DFL, DBR pieces). If that is not the case, then you have made a mistake in phase 2a. Repeat steps a-c if necessary for the other triad of corners. Find any corner piece that needs to be twisted clockwise. If there are none, choose any other incorrectly oriented corner. Hold the puzzle so the chosen corner is at DBR, and some other incorrectly oriented corner is at DFL. Do UBR UFL' UBR' UFL three times. Do UBR' UFL UBR UFL' three times. Repeat steps a-d until all the corners are correct.